There are many pro-austerity commentators who have been pronouncing that the worst of the Eurozone crisis is over. Of-course, they follow these pronouncements with claims that improvement was all down to the austerity. I must live in another universe because my reading of the data tells me that austerity continues to weigh down growth and prosperity in the Eurozone as industrial production and employment fall. I have been updating my Eurozone databases today to reflect recent Eurostat data releases and this blog provides some insights into what the data is currently telling us. The message is consistent with my interpretation that recovery is still not occurring and a major policy reversal in favour of stimulus is desperately warranted. The data tells us that Eurozone production and employment still going backwards = 5 years after the crisis began. On September 12, 2013, Eurostat released its latest data on industrial production, which announced that – Industrial production down by 1.5% in euro area. In July 2013 compared with June 2013, seasonally adjusted industrial production … fell by 1.5% in the euro area2 (EA17) and by 1.0% in the EU28 … In July 2013 compared with July 2012 … industrial production dropped by 2.1% in the euro area and by 1.7% in the EU28. There had been a slight rally in the data in June 2013 but the trend is still downward and accelerating. Even the powerhouse economy, Germany contracted by 2.5 per cent in the year to July 2013, in terms of industrial production. Greece contracted 8.2 per cent over the same period, Ireland 7.9 per cent, and Italy 4.3 per cent. Capital goods production (a sign of investment trends and future growth) fell by 3.3 per cent in the Eurozone in the year to July 2013. It doesn’t look like the “worst is over” to me. The day after this release, Eurostat put out the latest national accounts estimates for employment – Employment down by 0.1% in euro area, stable in EU27 – which also presented fairly bleak news. 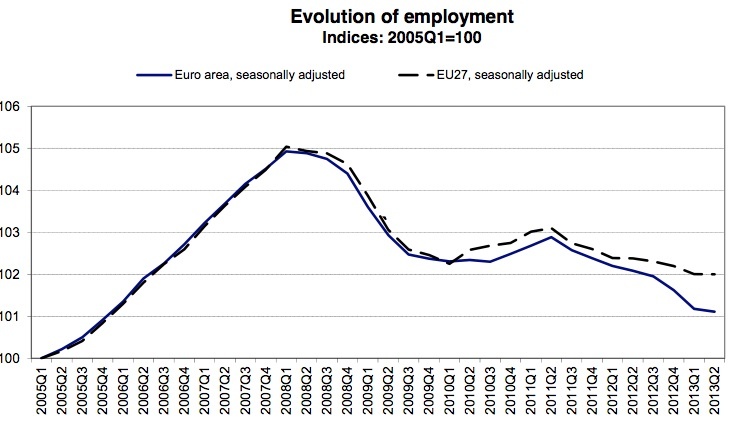 The number of persons employed … decreased by 0.1% in the euro area … and remained stable in the EU272 in the second quarter of 2013 compared with the previous quarter … In the first quarter of 2013, employment decreased by 0.4% in the euro area and by 0.2% in the EU27 … Compared with the same quarter of the previous year, employment fell by 1.0% in the euro area and by 0.4% in the EU27 in the second quarter of 2013 (after -1.0% and -0.5% respectively in the first quarter of 2013). 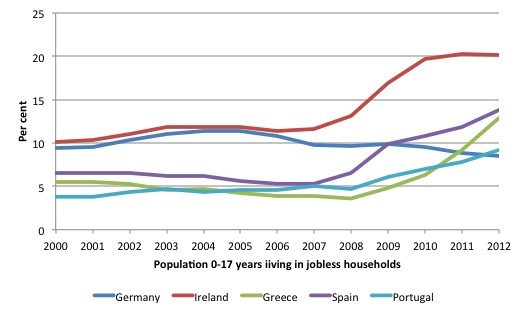 The following graph is taken from the Eurostat publication and is self-explanatory. Those results do not signal a recovery is underway although it is true that employment growth in persons lags the growth cycle after a downturn because firms make hours adjustments first while they work out whether a renewal of demand growth is likely to endure. But that type of adjustment is not consistent with an ongoing decline in overall employment. Since the first-quarter 2011, employment has fallen in every quarter. In the year to June 2013, employment fell by 4.3 per cent in Greece, 3.7 per cent in Spain, 2.2 per cent in Italy, 6.6 per cent in Cyprus, 4 per cent in Portugal among the largest contracting states. The employment data dovetails with the industrial production results fairly closely. Total industrial employment in the Eurozone fell by 1.5 per cent in the year to June 2013. Construction employment fell by 6.3 per cent in the Eurozone. The employment to population ratio is a useful measure, because in normal situations, its variation is driven by the numerator, that is, changes in employment. This is because the denominator, population, is fairly stable and cyclically invariant (usually). This overcomes deficiencies in rates that are computed using the labour force as the denominator – that latter being cyclically sensitive – rises in good times and falls in bad times. I also say “normal situations” because what we are seeing in nations such as Ireland, Spain, Latvia etc where hundreds of thousands of workers are migrating out to other nations in search of work is abnormal. 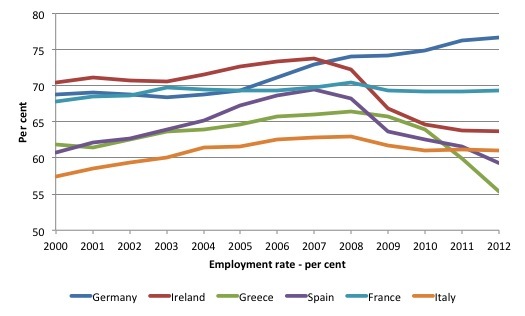 The following graph shows the employment rate forces selected Eurozone nations between 2000 and 2012. The data is taken from Eurostat’s labour force survey. … by dividing the number of persons aged 20 to 64 in employment by the total population of the same age group. So teenagers are excluded from the measure and, if included, would make the negative trends much worse than they already are. The data shows, for example, that Greece has gone from a peak of 66.8 per cent in 2008 to 55.3 per cent in 2012, and almost certainly much lower by the end of this year. They will have around 50 per cent of their adult (over 20s) working age population without work. That is an extraordinary result for an advanced nation. The Irish miracle has seen its employment rate fall from a peak of 73.8 per cent in 2007 to 63.7 per cent in 2012 and falling. Spain – peak at 69.5 per cent in 2007 to 59.3 per cent in 2012 and falling. Latvia’s peak was 75.8 per cent in 2008 and in 2012 it was 68.2 per cent after falling to 65 per cent in 2010. Of-course, the ratio will rise if there is considerable out-migration from the nation even if employment is still falling as it has in Latvia over the first six months of 2013. It should be noted that the German result should be tempered by the knowledge that over the period shown (particularly after the Hartz reforms) that the quality of work has declined (increased underemployment, casualisation and unstable jobs – so-called “mini-jobs”). Please read my blog – 72% youth unemployment – the crowning glory of the neo-liberal infestation – for more discussion on the Hartz reforms. Mini-jobs were the brainchild of the Gerhard Schröder in 2003 as a way of dealing with the high unemployment that followed the integration of East Germany. These jobs are precarious, pay a pittance and extend to the employers benefits in the form of lower social insurance contributions etc. The standard benefits accruing to mainstream workers – such as accumulating unemployment benefit claims etc are denied to the mini-job workers. Around 20 per cent of all employees are now in mini-jobs and many work in multiple jobs to scrape a living income. The evidence is that people are becoming trapped in these low-wage jobs with no upward mobility prospects. Firms are increasingly falling over each other to fractionalise existing jobs so as to exploit the low-wage opportunity. In the blog cited above, I discuss how these so-called reforms helped amplify the consequences of the design faults in the monetary union as the global crisis developed. German real GDP growth was fairly poor in the period leading up to the crisis and was driven by its low-wage export-led approach which stifled domestic demand and relied on large current account deficits in its neighbours. The so-called “over-spending” of nations such as Greece were just a mirror image of the underspending by German workers. The underspending was the direct result of the move to labour market deregulation and the shift in real income away from wages towards profits that followed. The neo-liberals are continually invoking threats about the burdens the current generation will leave to their grandchildren as a result of budget deficits. However, they never talk about the burden that joblessness leaves – both the direct experience and the passive experience (growing up in a jobless household). The following graph shows the share of persons aged 0-17 who are living in households where no-one is working for selected European nations between 2000 and 2012. The data is from the Eurostat Labour Force survey (table: lfsi_jhh_a). The picture is clear. In the nations that have imposed massive austerity, this ratio has risen rather sharply. Children growing up in jobless households tend to inherit the socioeconomic disadvantage of their parents as they, themselves, enter adult lives. They are relatively deprived of resources in the short- to medium-term and fail to develop the necessary workforce and life skills that produce better outcomes. Jobless households are disproportionately likely to be reliant on welfare, have low incomes and experience financial stress, and members of these households report worse physical and mental health and lower life satisfaction than members of households where someone is employed. The Report also highlighted what is known as “intergenerational welfare dependency”, which starts with the youth in jobless families leaving school early and not engaging in the labour force. Youth inactivity is linked to dependency on parents or social welfare, family problems, substance abuse, physical and sexual abuse, violence and crime. The lack of connection with the labour market starts the cycle of “low self-esteem and poor physical and mental health”, which endures over the person’s adult life. Australia, by the way, “has the second-highest percentage of children living in jobless families in the developed world.” So while I am writing about (and condemning) Europe today, in this regard, I am fully aware of the disgraceful record of my own country and the failed governments that seem to get elected (one after another) here. I did not have much time today so the blog was short as a consequence. The most recent data is clear – Eurozone production and employment still going backwards. The related data indicators, which are not usually reported in the mainstream media – of which I reported two here – show that trends are worsening. Europe is creating an intergenerational nightmare for itself – all because it is being led by political ideologues, who will be long pensioned off in relative luxury by the time the real consequences of their policy folly are in full view. Austerity is one reason the European economy is failing to recover from the Great Recession. The failed monetary union is another (meaning the EU is a foreign currency for sovereign nations). But another issue is the limits to growth. They have been reached. And no lesser person than the German Finance Minister Wolfgang Schauble has an article in today’s FT lauding the success of austerity. He says, “The world should rejoice at the positive economic signals the eurozone is sending almost continuously these days.” ! . It really beggars belief when you look at the employment stats highlighted by Bill and also the ever expanding Northern European trade surplus. Europe is as dependent as it as ever been on importing overseas demand and growth rates are non existent in the majority of the continent. If Europe is growing, it shows that austerity is working. If it’s not, then “reforms” and more austerity are needed. It’s that simple. Unfortunately, it isn’t quite that simple. Consideration 1: the data are correlations, and correlations are not causality; consideration 2: statements need a ceteris paribus clause to rule out growth being due to other factors if considered to be statements of causal relationship. Slightly off topic Bill. We are desperately short of MMT leading lights in the UK. Does the following from Cambridge University fit the theory. http://www.cbr.cam.ac.uk/pdf/BM_Report3.pdf . There is a follow up discussion at http://www.cbr.cam.ac.uk/news/index.htm#BMresponse . All the best. That seems to be because nobody wants to fix the current system. They all appear to be embroiled in trying to create the perfect model and explanation of everything fist. It’s what we call in IT ‘analysis paralysis’. Cambridge is the centre of the Post Keynesian movement, and as far as I can see they don’t appear to want to leave their monasteries and the habit of publishing work in journals nobody reads other than other members of the sect. There is an unusual data pattern in the UK unemployment figures. Our participation rate remains high, unemployment remains stable to declining and the number of hours worked has gone up. The effect of the recession has not appeared in the unemployment figures, as it has in other states, but in the productivity figures. Fundamentally you can’t measure the output gap. You can only guess at it. You can measure the unemployment level though. So the policy design for the UK is straightforward. You guarantee everybody an alternative job at the London living wage, and you state clearly that you expect that to be paid for by the quantity expansion of the economy. Where it is not covered by quantity expansion, you will deal with the inflation by taxing away the spending of the wealthy – to release capacity.